Kidney stones form inside the kidneys and are incredibly painful to pass. 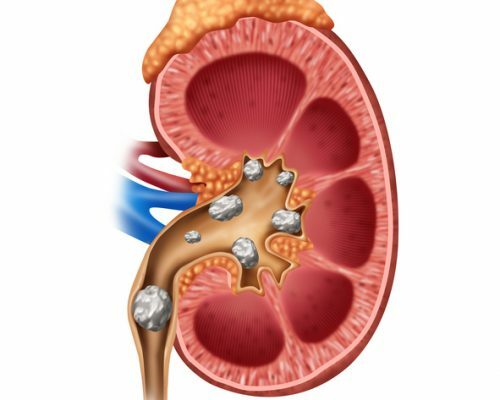 There are many reasons why a kidney stone would develop, such as inadequate hydration, excess calcium buildup, and excess uric acid accumulation associated with a high protein diet. There are also other, less familiar causes of kidney stones you should be aware of. Kidney stones can form when there is too much calcium oxalate in the body. Oxalate can be found in many fruits and vegetables, and even chocolate. Additionally, the liver can produce oxalate, adding to the risk of stones. Too little calcium, however, can cause kidney stones, too. According to research from Harvard Medical School, people who consume low amounts of calcium are actually more prone to kidney stones, in comparison to those who consume too much calcium. Although oxalate can form kidney stones, if there is not enough calcium to bind with in the digestive tract, it will begin to bind with the calcium found in urine, forming the stones. Thus, balancing your calcium intake is crucial. There is mounting evidence to support that leafy greens are healthy and can contribute to overall good health. However, too much of a good thing can land you with kidney stones. Oxalates are to blame in this scenario as well. Similar to a lack of calcium, oxalate will begin to form in the urine, forming the stones. If you do have a high amount of oxalates in your system and can’t curb the leafy green habit, talk with your doctor about possible substitutes that will help to lower your levels. Salt intake is under everyone’s radar nowadays, as it can contribute to hypertension, which can impact the heart. It should be of no surprise then that salt can also contribute to kidney stones. Too much salt can prompt the kidneys to excrete high amounts of calcium, which can bind with oxalate, creating kidney stones. See a pattern here? To reduce your risk of kidney stones from sodium, try to follow the dietary recommendation of 2,300 milligrams – unless you have high blood pressure, then keep it down to 1,500 milligrams. Soda is still under scrutiny for its negative health effects. Although staying hydrated is a good way to prevent kidney stones, it’s not the wisest decision to pick soda as your beverage of choice. Previous research has found that one soda a day can increase one’s risk of kidney stones by 23 percent. The culprit behind the added risk is fructose, which feeds into chemicals that can lead to kidney stones. Even if your eating habits are not similar to your parents, heredity can increase your risk of kidney stones. If either one of your parents have had kidney stones, your risk goes up. Your ability to absorb oxalate may be determined by your parents, ability to do so. Some food items, mainly plant-based, contain high levels of oxalate. Here are the most common foods that contain oxalate, along with their oxalate levels. Some of these kidney stone causes might be completely new to you, while others are old news. It’s important to be aware of what can increase your risk of kidney stones, as they can be quite painful. Typically, you can pass a kidney stone if it’s small enough, but if it’s too large surgery may be required.